A common enough method of graphic representation of the structure of statistical collections is a pie chart, as the whole idea is very clearly expressed in a circle, which represents the entire set. The relative magnitude of each value is represented as a circle sector, area of which corresponds to the contribution of this value in the sum of values. This type of diagramming is convenient to use when you need to show the value of each share in the total volume. Sectors may be depicted in a general circle or be separately arranged at a small distance from each other. Pie charts are widely used in the reports, as they are visually appealing. The other side of the coin is, however, that pie charts are very simplified chart type that can not provide data well. Consider the possibility to use pie charts only after data processing, which results in a small number of data points. For pie charts, each data group is displayed in a separate slice on the diagram. It is necessary for a pie chart to add at least one data field and one category field. If you add more than one data field to the pie chart, two data fields are displayed in the same graph. While calculating the pie chart shares some values like empty, negative or zero are not taken into account. Therefore, these values are not displayed in the pie chart. If you want to visualize the values of these types in the diagram, you should choose a chart type that is different from a pie chart. Unlike most other types of charts, the legend to the pie chart shows the individual data points instead of individual series. At least two values are required for a pie chart to allow valid comparison between the two proportional shares. 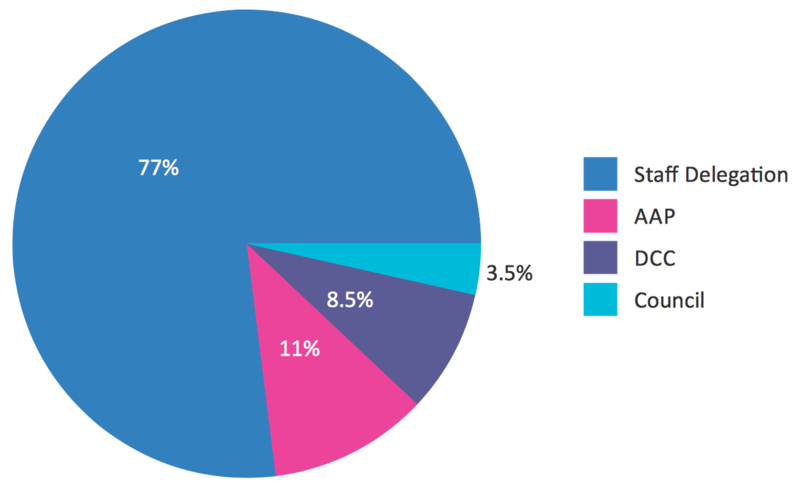 If a pie chart contains only one color, make sure that you have a category field to group by. If the pie chart contains no categories, it performs statistical processing of the data fields values to get one a value for display. To design pie and donut charts use ConceptDraw DIAGRAM diagramming and vector drawing software extended with Pie Charts solution from Graphs and Charts area of ConceptDraw DIAGRAM Solution Park. 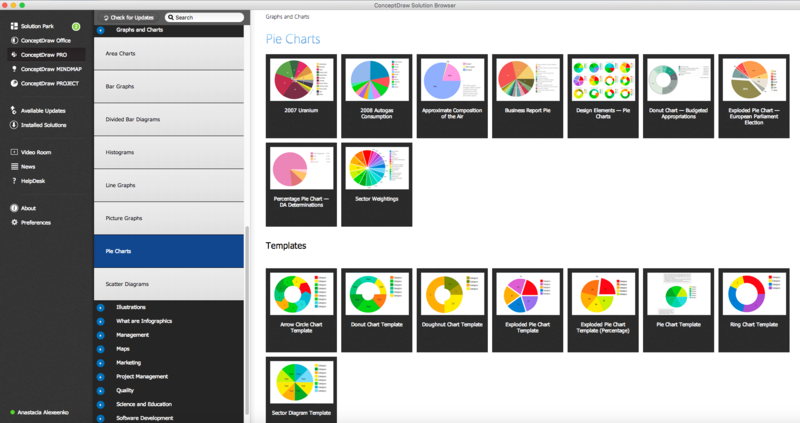 The Pie Charts solution provides templates, samples and a library of vector stencils for quick and easy drawing pie and donut charts. The shapes library Pie Charts contains ready-to-use predesigned pie and donut chart objects you can simply drop into your document, quickly set up data and obtain professional looking different types of pie and donut charts: percentage and absolute values pie charts, separated pie and exploded pie charts, pie charts with shifted slices, percentage and absolute values donut (doughnut, ring) charts, arrow ring charts. ConceptDraw DIAGRAM software with Pie Charts solution helps to create pie and donut charts for effective displaying proportions in statistics, business and mass media for composition comparison, i.e. for visualization of part percentage inside one total. Using pie charts always leaves a free space on your page or slide. You can use this space to add illustrations or text labels provide your audience with additional information which may help your audience understand the subject. This example was created in ConceptDraw DIAGRAM using the Pie Charts Library from the Pie Charts Solution. An experienced user spent 5 minutes creating this sample.